Your mom always said breakfast was the most important meal of the day. We like it so much, we even have breakfast for dinner sometimes! A good, Southern-style breakfast can include anything from biscuits and gravy to shrimp and grits. That’s right – we like seafood for breakfast, too. Need something light with your coffee so you’ll have room for a fabulous brunch? Visit Stacey Drugs & Olde Tyme Soda Fountain. Take a step back in time and experience Foley in the 1930s. 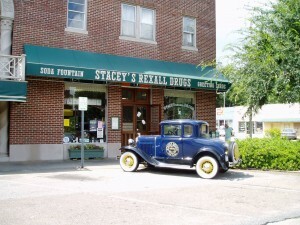 Not much has changed since Stacey’s opened in 1929 – the pharmacy still delivers medicines to its customers in its 1931 Model A, and self-serve coffee is still 10 cents a cup. A bagel is only $1.50 and a BLT won’t break the bank at just $3. The $3.50 salad sampler provides a choice of egg, tuna or chicken salad. Of course, no one will judge you if you top off brunch with a chocolate malt or banana split, either! Sometimes you’re just in the mood for a nice cup of tea. That’s when you visit The Copper Kettle Tea Bar for brunch. Fruit salads pair beautifully with a blueberry almond or lemon lavender scone, and of course you’ll find a wonderful variety of specialty brews to sip alongside your brunch.